With the number of diseases mosquitoes carry, including the West Nile and Zika viruses, avoiding them is a top priority, especially during the summer months. But turning to traditional bug sprays, puts you at risk of all that their various toxic ingredients pose. Studies show that long-term and frequent exposure to DEET can cause brain function abnormalities, particularly in children. It takes several months or years for symptoms to show up. As mosquitoes quickly evolve to become resistant to DEET, it hardly seems worth the risk. Still, the United States Environmental Protection Agency (EPA) believes that normal use of DEET presents no health concerns. Approximately one-third of the population of the United States uses one or more of the over 230 insect repellent products available in which DEET is one of the main ingredients, with up to 100% concentration, even though a recent Consumer Reports survey of 2,011 adults in the U.S. found that just one-third believe existing insect repellents are safe for adults. Even fewer – just under one-quarter – think they’re safe for children. But, according to Chicago-based research firm IRI, 63% of the $206 million Americans spent on personal insect repellents in the past year (a total of $126 million), went toward DEET-based products. However, the Environmental Health Association of Nova Scotia reports that, as of December 2014, Health Canada has banned insect repellents containing more than 30% DEET, citing health risks and evidence that increasing the percentage doesn’t increase insect-repelling power. Health Canada has also banned two-in-one products containing sunscreen and DEET, as they create the potential for people to be exposed to too much DEET due to the need to reapply sunscreen more often than is necessary for reapplying DEET insect repellents. Health Canada also says that children younger than 12 shouldn’t use a DEET-containing product daily, and children younger than six months old shouldn’t use it at all. Unless you’re prepared to don protective clothes, goggles, and a mask when using DEET products, it’s best to employ safer alternatives. There are several essential oils, such as citronella, peppermint, and lemongrass, which are known to help safely repel nasty, biting insects. Avoid the harmful toxins and chemicals like DEET used in various bug sprays, and keep yourself and your loved ones safe this summer. For a helpful infographic about the facts about and hidden dangers of DEET, visit https://healthresearchfunding.org/dangers-deet/. Young, Leslie. (20 May 2018). 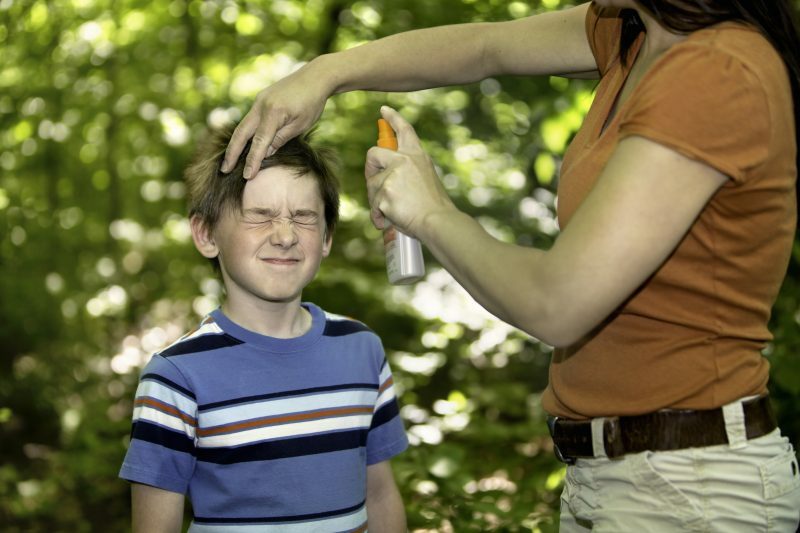 Insect repellent – does natural beat DEET? Global News. (8 May 2018). How Safe Is Deet? Consumer Reports. Sowards, Will. (10 Aug 2016). Why Mosquitoes Are The Most Dangerous Creature. Passport Health. (26 Jul 2014). Dangers of Deet. HealthResearchFunding.org. (2003). The Hazards of DEET. Environmental Health Association of Nova Scotia. DEET. United States Environmental Protection Agency.